Module Manager enables you to browse the modules directory on modules.processwire.com, download, install or update them. the JqueryDataTables module to be installed before you can install Modules Manager. "allow_url_fopen" to be enabled in your php.ini. "openssl" PHP extension needs to be installed on your server. When installed you'll have a new admin page under "Setup", feel free to move it to wherever you like. On first load it will download and cache a json file from where it will look for modules already installed, new versions, or modules not yet installed or not downloaded and provide actions according to its state. There's a refresh button to look for new modules already put in modules directory and refresh the cache file with the remote list of modules. If you download a module it will create a temp zip file in the assets folder, extracts it, creates a new folder in /site/modules/ using the class name, and move the files in there. After it's done it deletes the temp files. It will show a message and show an install button, which you can use to install it, but don't have to. If you update a module it will do the same process as above, and just replace the current files with the new ones. This version is still beta and in testing. Feel free to try it out own your own risk. Current version uses file_get_contents" and "copy" php methods to retrieve the json feed from external domain. This requires the php to allow it in php (allow_url_fopen). Download of the module zip is done using copy(). Also on my local install I had to adjust the /site/modules/ and /site/assets/ directory to have write permission by php. fix for "\n" line breaks in summary causing an error in jQueryDataTables parsing the json. added external links if available below description to project (github), direct download and forum support thread. When the lazy cron is running the request will be blocked for a few second, this is currently due to how the lazy cron works. Maybe we will be able to optimize this in future. After install you need to define the interval, an recipient email, subject and optional a "from" email address. There's also a checkbox to activate/deactivate the module running the lazy cron job. Note that this requires someone to hit your website (or admin) to get executed, so interval times can vary. It will also save a notification log modulesmanager_notification_log.txt with an entry when the lazy cron was executed in your site/assets/logs/ folder. added jQuery DataTables to list modules. 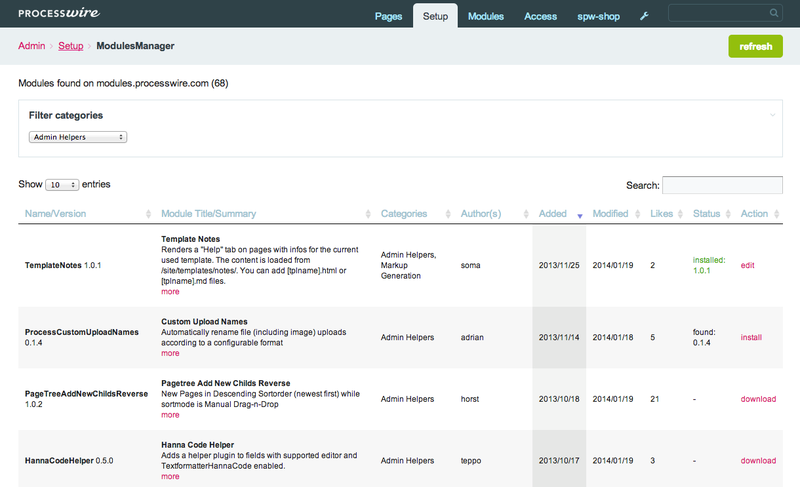 This enables convenient browsing with pagination, live search filter and sorting. State saving via cookies is enabled so if you come back it shows the table how you left it. added iframe modals for download, update, edit and install links. So you can now install modules without leaving the ModulesManager page. This is using Magnific lightbox by default, if installed, otherwise it will take the older Fancybox. replace "page-edit" permission for module with "modules-manager"
added max_redirects config option used by download stream context. Increase this value if download of zip failes. default 3. Language Packs and Site Profiles now show up but will have a "more" link to the repository page. Amazingly helpful module! Loads fast and it has worked with every module I have tried so far!